A Labor Of Love For Mid-Century Moroccan Musical Diversity In 1959, Paul Bowles traveled around Morocco to record as much traditional music as he could. A new box set of those recordings tells almost as much about Bowles as it does Morocco half a century ago. Music Of Morocco features recordings of classical Moroccan musicians. Composer and author Paul Bowles first went to Morocco in 1931. He fell in love with the country, returning often and eventually moving to Tangier, where he lived from 1947 until his death in 1999. 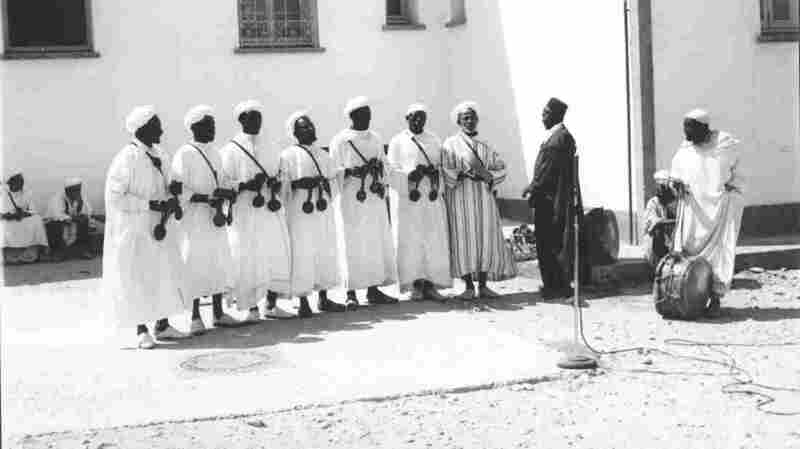 Among the things Bowles valued most about Morocco was its varieties of music. During an intensive five-month period in 1959, Paul Bowles made a series of recordings of Moroccan music for the Library of Congress. Now, they have been released as a four-CD box set called Music Of Morocco. These vivid recordings tell us almost as much about Bowles as they do about Morocco a half-century ago. To record this music, Bowles traveled far and wide by Volkswagen Beetle with a large reel-to-reel tape recorder. Often, musicians had to come to locations where there was electricity, and Bowles would do his best to arrange them around his microphone to get the sound he desired. In the northern city of Fez, he recorded an entire Andalusian orchestra, music with ties to medieval Moorish Spain. Bowles was not a scholar, out to study and survey; this was a labor of love. These CDs come with a 120-page booklet, full of Bowles' colorful field notes and commentary complied by ethnomusicologist Philip Schuyler. Schuyler points out that Bowles was willing to resort to surprising, even questionable, tactics to get what he wanted. When one flute player insisted his instrument had to be accompanied by a drum, Bowles demanded that he play it alone, proclaiming "the American government wished it." There's a fascinating contradiction here. Bowles always wanted to record the most authentic, archaic, traditional version of everything — except when something about the sound offended him personally. For instance, when he heard the buzz on a traditional bass lute as distortion, he made the musician remove the resonator and record again without it. To listen through these diverse recordings and read Bowles' urgent, revelatory notes is to enter a realm of his psyche. Bowles does not render these sometimes strident sounds safe or friendly. But, he makes them his. This collection has the power to lure us into his own deep hypnosis, his gut-level obsession with a North African land he has chosen to call home.